The Brothers of the Night’s Watch seek a new leader from among their ranks. Jeor Mormont wishes to promote one who can improve the infrastructure of the Gift, the bountiful and undeveloped area south of the Wall bestowed to the Watch by the Starks thousands of years ago. Drawing sustenance from the unforgiving landscape of the north offers enough challenges, but whomever takes up this task must also man and defend the Wall against the onslaught of Wildlings fighting their way into Westeros. Many brothers now compete to build, defend, and do what they can to protect Westeros, but only one shall rise above their brothers to become the new Lord Commander. But be wary — the north holds many dangers, and winter is coming. A Game of Thrones Catan: Brotherhood of the Watch is based on the classic Settlers of Catan base game. In this game, each area in the Gift supplies one of five resources: lumber, brick, wool, grain, and ore. The barren Ice Fields, however, produce nothing. Players take on the role of Brothers of the Night’s Watch and use these resources to strengthen their hold on the north by building roads, settlements, and keeps; recruiting guards for their patrol; or buying development cards. Each of these acts bring players increased power and recognition through the awarding of victory points. 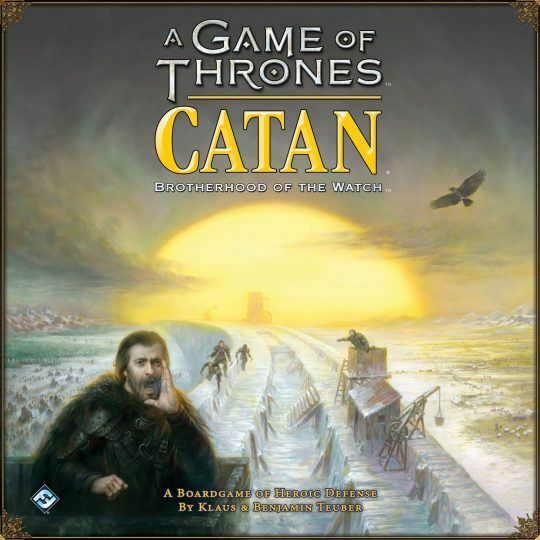 The objective will be familiar to players of the original Catan; the first player to achieve ten victory points wins the game and becomes the new Lord Commander of the Night’s Watch. But this is not as easy as it sounds as the area surrounding the Gift can be treacherous. Wildings from north of the Wall have crossed over and follow their own rules of honor, which often conflict with the laws of Westeros. One of their ranks, Tormund Giantsbane, does not respect the Watch’s claim to the land as he moves throughout the Gift, robbing resources from the Brothers sent to provide for their Order. While Tormund runs amok south of the Wall, Wildling forces gather in the Frostfangs, awaiting an opportune moment of weakness to breach the Watch’s defenses and spread throughout the fruitful lands of Westeros. In addition to building within the Gift, players must strategically balance their resources to defend the Realm from Wildling raiders. Each player may recruit up to seven brothers from the prisons of Westeros to don their specific color and man their section of the Wall. When the Wildings attack, each player must use their guards to fend off the onslaught. If there are more guards than Wildings, the Wall stands. If there are not, the Wildings invade the Gift and pillage the settlements and keeps therein. Yet loyalty only goes so far — guards are useless defending the Wall from Climbers who slip past them, and if they encounter a Giant, at least one guard is bound to desert his post. Each player also has a hero to aide in their toil, based on the order of play. The first player will utilize the talents of the Lord Commander himself, Jeor Mormont, while the second player will enjoy the company of Samwell Tarly, the third will work with Bowen Marsh, and the fourth will employ the services of Master Builder Othell Yarwyck. Each hero offers a unique ability to each player which they can use up to twice during the game. Once a hero’s ability has been used, players have a choice to keep that hero or choose another of the eleven heroes to aide them. Players should factor the heroes’ abilities into their strategy to quickly earn victory points and gain renown within the Watch. The Wildling invasion marks the truest test of the Brothers of the Watch and your own competency as a commander. A failure at the Wall has a devastating impact on the Gift, even if it does not destroy the players. A Game of Throne Catan: Brotherhood of the Watch has two forms of victory, though one may feel hollower than the other. Victory occurs when a player has both improved the infrastructure of the Gift and successfully kept it safe from invaders. This is shown when a player has achieved ten victory points by any combination of building keeps, roads, and settlements; hiring three or more guards to keep the Wall safe; and buying development cards to increase their prestige, all while safeguarding the Gift. However, if the Wildlings breach the wall three times throughout the game, an alternate victory takes place. If this occurs, the game ends immediately as the Brotherhood of the Night’s Watch can no longer delay their decision. The player commanding the most guards holding their posts on the Wall gains the title of Lord Commander and wins the game.